What Type Of Forklift Propane Service Is Right For You? If your business uses forklift propane, you are undoubtedly on a delivery service of some kind, but is it the best type of service for your use? Under-delivery can result in costly down-time while you wait for additional gas, but you shouldn’t be paying for more propane that your forklifts, floor sweepers, and scissor lifts can possibly burn. What’s the right balance for your operation? Cylinder Exchange – If your company occasionally uses a few pieces of propane-powered equipment, or regularly uses one or two on a predictable schedule, cylinder exchange makes good sense. You trade your empty cylinder for a full one when you need it or schedule automatic, periodic deliveries, and it is simple and affordable to keep an extra on hand, just in case. On-Site Re-Filling – Companies that run several pieces of equipment on propane may find on-site cylinder re-filling a better value than cylinder exchange. This is especially helpful when your equipment uses propane at vastly different rates from each other, or when you have cycles of heavier and lighter use. The bulk delivery truck will come on a pre-set schedule and fill each tank as needed. Bulk Tanks – For companies that run lots of propane-powered equipment on a consistent basis, a bulk tank may be a sensible investment. With a bulk tank, you can re-fuel all of your propane equipment on-site, so it offers the best flexibility of all options. There is an initial investment involved in getting the required permits and leasing or purchasing the tank and transfer equipment, but if you’re using a high volume of propane, the investment will likely be well worthwhile. 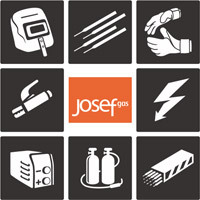 Josef Gas is an independent distributor of industrial gases and propane. We operate our own fleet of bulk and cylinder delivery trucks in the greater Toronto and Kitchener, Waterloo, Cambridge areas. Contact us online or call us today to consult with a representative; we can help you evaluate which type of forklift propane delivery will give your company the best value. ← How Does Liquid Oxygen Improve Wastewater Treatment?